My introduction to the craft of marquetry came from The Art and Practice of Marquetry written by W.A. Lincoln. There were a handful of black and white photos and one that caught my eye was a village scene by Paul Spindler. A lot of marquetry has a paint-by- number look to it, but this picture went way beyond that. I kept my eye out for more work by Spindler. Eventually I found out that Paul Spindler was just a part of a family tradition. His father Charles was a celebrated marquetry artist working in Alsace at the turn of the 20th century. Paul joined his father around 1930. The workshop is now run by Paul’s son, Jean-Charles, and they are still making wonderful panels. 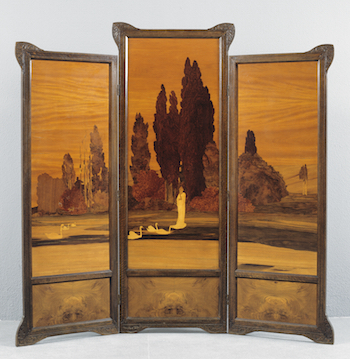 The Musée d’Art Moderne in Strasbourg has this beautiful folding screen made by Charles Spindler in1902. I love the wood used for the sky and burls in the tree foliage. The white swans and the dress jump out of this pleasing composition.